French Knots are my absolute favorite among stitches. It is so fun to make and gives a strong impact, besides it’s very beautiful. 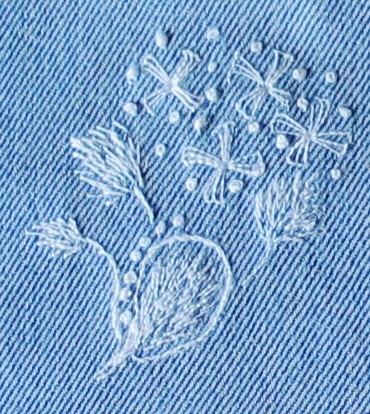 I read on somebodies blog (can’t remember whose) that French knots are like salt for an embroidery. If it is dull and boring add a few knots and it will immediately get better. I made a flower in French dots only. I love them thick and dense. 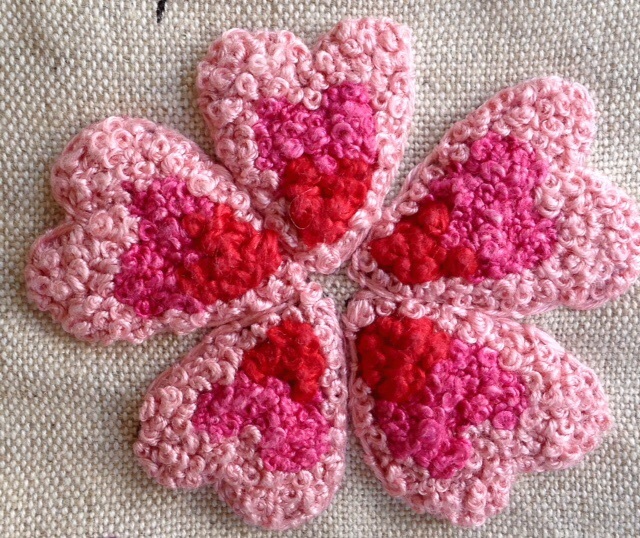 These petals/hearts are surrounded by a coached thread to get a distinct edge. I run a small Bed and Breakfast. 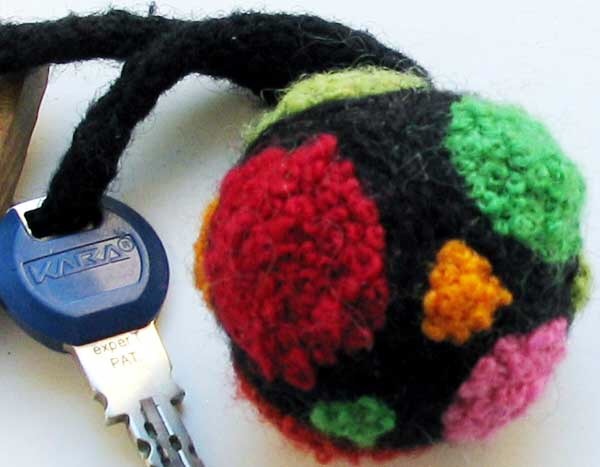 For our keys I have made felted balls, some of them with embroideries. This one has dots with dense French Knots surrounded by coached black knitting yarn, all in wool. 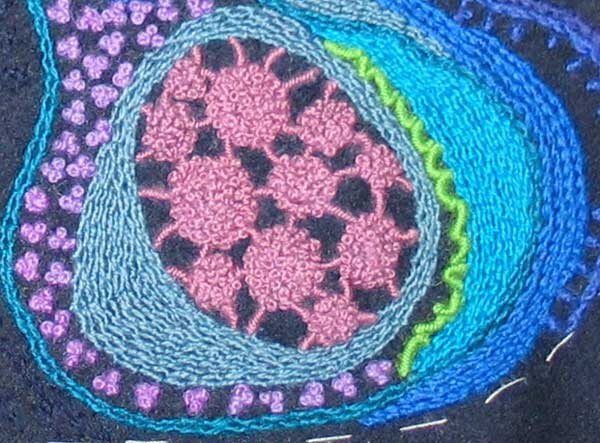 The ball is made of small bits of yarn, left over from previous knitting projects and felted in the washing machine. The hanger is a knitted i-cord. I made a handbag filled with different kinds of knots a couple of years ago. 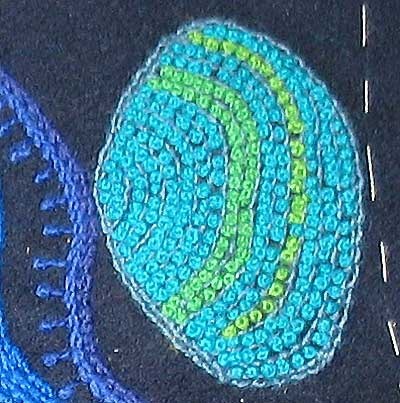 Most of the knots are French knots. Here is another part of the bag. Fabric and embroidery floss are wool. 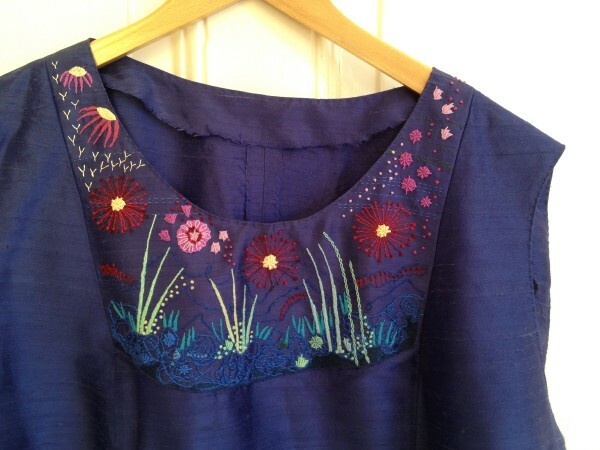 And finally French knots on a dress. This entry was posted on lördag, oktober 24th, 2015 at 19:39	and is filed under Broderi, TAST (in English). You can follow any comments to this entry through the RSS 2.0 feed. Both comments and pings are currently closed.